"Chock-full of sweet ripened bananas and juicy blueberries. 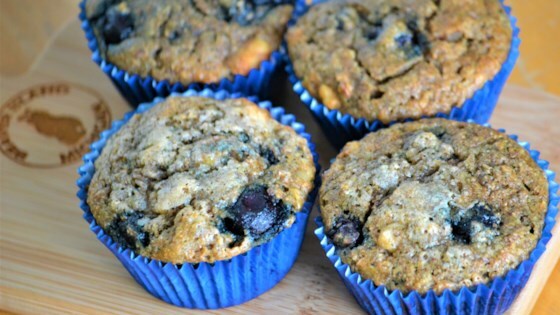 These muffins are great for a midday snack or as part of your breakfast. Made with whole wheat flour and sweetened with pure maple syrup, these moist muffins are delicious, nutritious, and deeply satisfying!" Preheat the oven to 425 degrees F (220 degrees C). Grease a 12-cup muffin tin. Blend flour, baking soda, salt, and baking powder together in a bowl. Make a well in the center; add eggs, maple syrup, applesauce, and coconut oil. Stir by hand until just combined. Add bananas, blueberries, and walnuts. Mix until just incorporated. Divide batter evenly into the prepared muffin tin. Bake in the preheated oven, 6 to 7 minutes. Reduce heat to 350 degrees F (175 degrees C). Continue baking until a toothpick inserted into the center of a muffin comes out clean, about 15 minutes more. Cool muffins in tin for 5 minutes before transferring to a cooling rack to cool completely. The next time that I am going to make this, I am going to try and put some chia seeds to make it even more healthier! It was nice and easy! I would totally recommend these muffins!